← TPC Studio Stamps, Jackpot! I finished my card that gave you a sneak peek on yesterday. It features a really cute rocket-ship from the TPC Studio Rockets and Rayguns, stamp set. This set was a steal at Tuesday Morning. I paid $1.50 for the set and I will more than get my money’s worth out of it! I wound up going back over the light blue background with some Concord Grape Distress Ink to make the sky appear more like space. Once the ink was dry I splattered it with water to create the lighter circles you see in the photo. And finally I stamped the sentiment and then mounted the image onto the card. It was very hard to capture a photo that showed the true color of purple on this card. The color is brighter and lighter in person. 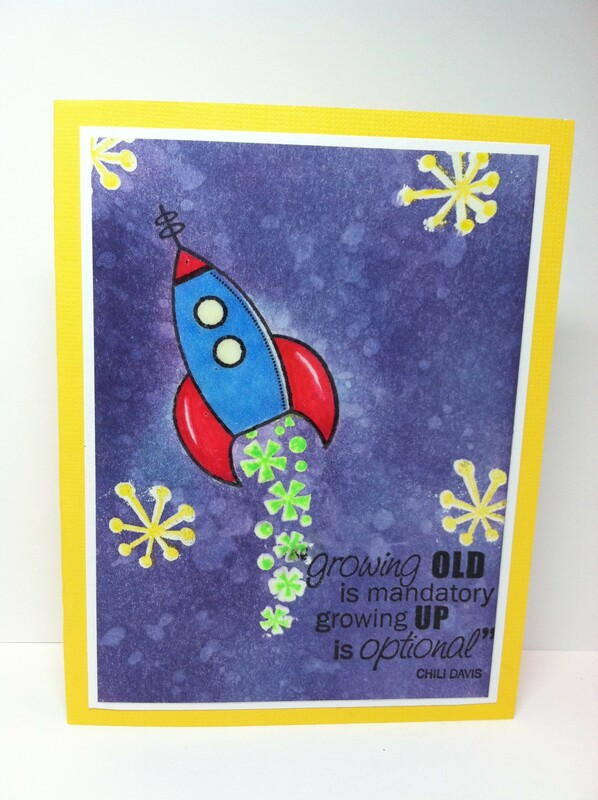 Posted in Birthday Cards, Handstamped cards, Masculine Cards and tagged cards for boys, rocket ship, TPC Studio Rockets and Rayguns, tpc studio stamps. Bookmark the permalink.